Crush of the Week – Think Pink Features! We have some fabulous features – lets check out the Crushes for the Week!! I love the pretty simplicity of these Starfish hoops from Carolyn at Homework! How fun would these be with a summer vignette or sweet beachy mantel? This Script Wall from Jeannine at The Country Cottage is really just amazing. And so fun. 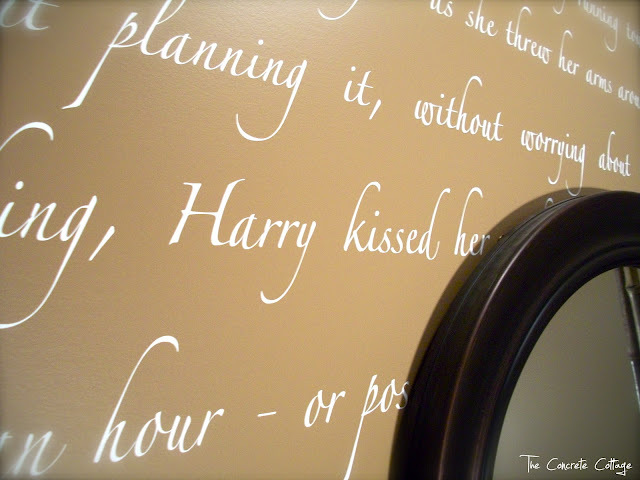 She did a whole wall with a section from Harry Potter – and I love the impact of how fabulous it looks on the wall! 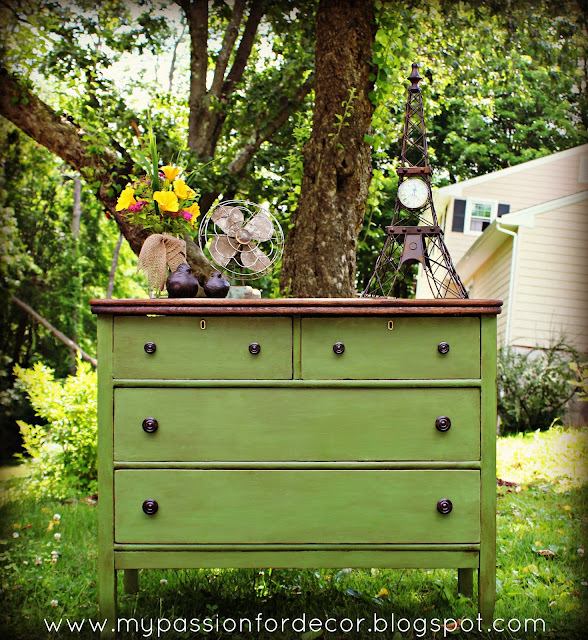 We have a seriously amazing dresser redo from Melody at My Passion for Decor! You’ll have to click over and see the before – it’s such a great transformation! 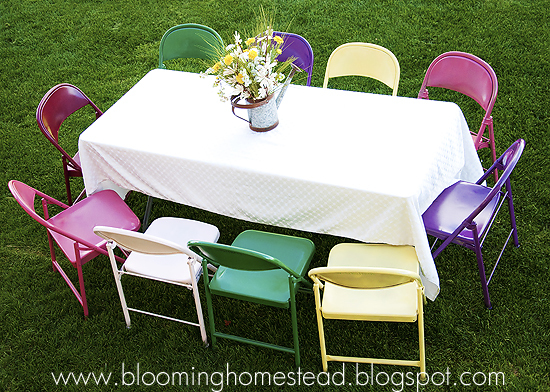 I am so loving the color in these Painted Metal Chairs that Blooming Homestead linked up! What a great way to dress up plain metal chairs! These Pleated Ribbon Cuffs are so sweet!! Jessica from Sunny Tuesday shared these over at Positively Splendid and I love them! You could use any ribbon for such a fabulous look – they’d be fun for a summer craft for older girls too! 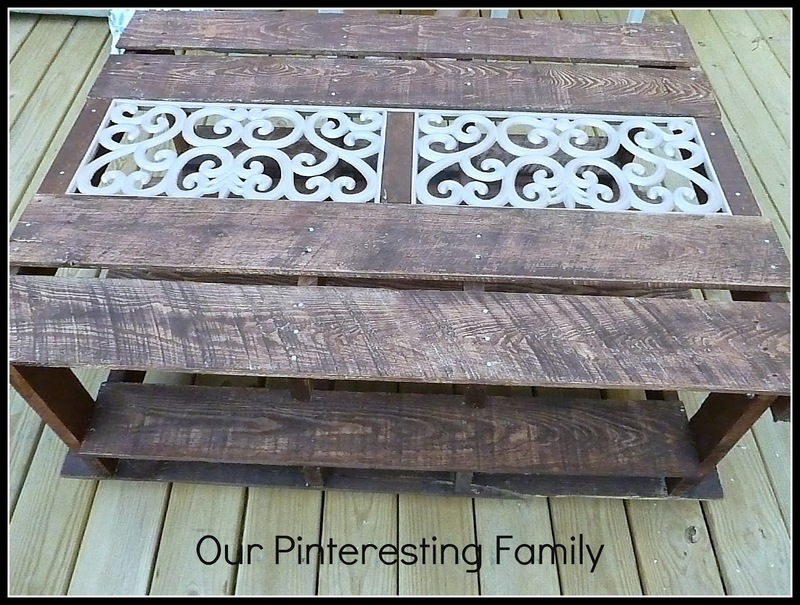 Our Pinteresting Family created a really fun Pallet Coffee Table! I just love the addition of the iron piece down the center!! I’m loving this pretty Messy Updo from Jessa at Jessa Jill! I think it would be so sweet for a summer beach party – or really any day! Um – how amazingly awesomely cool is this??? 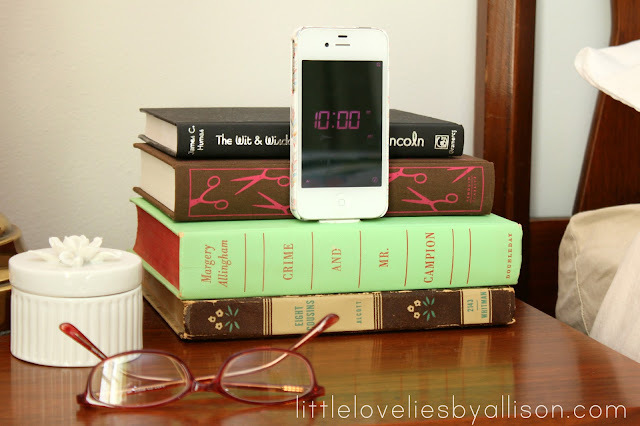 Allison from Little Lovelies made this super great iphone dock – from books! I would love something like this on my nightstand! 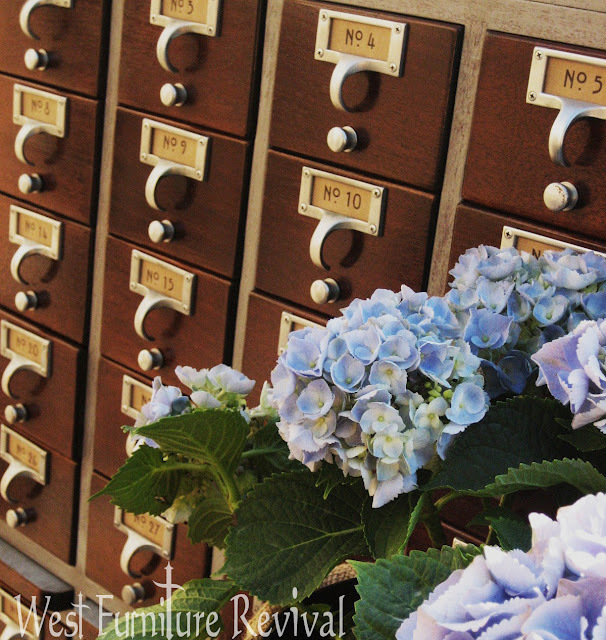 I have serious furniture envy here – check out his renovated Card Catalog from Lauren at West Furniture Revival!! What an amazing statement piece! Yay! Thank you all for linking up! If you were featured and would like a button, they’re on the Button Page. Weird right? Grab one and show it off! Ready for some Highlights of the Week?? Me too! Summer TV is the best – are you watching anything cool? I am always up for SYTYCD – if you’re with me, let’s discuss. Do you have any early favorites? What about Craft Wars? I’ve DVR’d it but have yet to watch – I’ve heard it’s really fun and we’ve got some fellow bloggers on there – yay! So my Sis went home this week – despite my best efforts to get her to move here to CA. I had a wonderful time and I can’t wait to show you the quilt that I made while she was here! We did tons of sewing and fun projects – and took pictures of pretty much none of it. :) That’s ok. It was such a great visit and now I have to do without her until the fall. Sad face. And last up – Weird Searches!! We had someone show up here with the phrase “cake pops fabulous!” Well, I absolutely agree sweetie, cake pops are fabulous. But usually search boxes aren’t for shouting enthusiastic random phrases into the internet. Just a tip. Now this search isn’t strange in itself, more for the case of – why did they end up here?? We had someone end up here with the search, “how to make a clay godzilla“. Let’s see. Clay projects? Nope. That’s almost as scary as scrapbooking. Godzilla projects? None of those either. Plastic flamingos and tiny circus animals are more the thing around here. Too bad. Last up we had a searcher land here with the question “what does www mean“. Hmmm. Let’s see. World Wide Web? No that’s silly. This is a creative blog – we can do better. Winter White Wreath? Walled Waterproof Walkway? Watercolor Wallpaper Wainscoting? Write With Wit? Wacky Wailing Walruses? Too much? Probably. I hope you have a fabulous weekend! Make sure to stop by tonight to check out our 4th of July Pinterest feature – and don’t miss Think Pink Sunday! WOW! Gorgeous. Love seeing my passion for decor featured. I think she is so talented!! And West Furniture Revival has the prettiest pictures =) The beachy craft from Homework is sweet too!! Thanks bunches for featuring my script wall!!! I’ve got to head over to Little Lovelies now and check out that iPhone dock! How cool is that!! craft wars is where it’s at! my new fave tv show!!! I am going to attempt a script wall. Obviously my stamina (and budget) will not allow for Silhouette cuts, but nothing will stop me from grabbing a white marker or ten and doing ma thang. Best idea ever. So “tickled” to have my starfish featured. What a gorgeous round up of projects – love them all. I’m really taken with that iphone dock. So cool! Thanks so much Bev!! Super fun features, Bev! That pallet table is fab. Ah summer tv. I do love it so. :) Craft Wars is so intense! But it was a lot of fun to see “our people” on there competing!